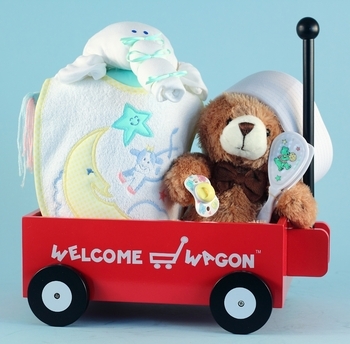 This unisex necessities mini wagon is a practical gift choice for every baby. The useful items coupled with some toys to entertain the little one make this a perfect way to say welcome home to the newborn. This design with neutral colors also makes the perfect baby shower present if you don't know what gender the baby is yet! This set is beautifully gift wrapped and is sure to please the new parents with its practical and fun gifts!